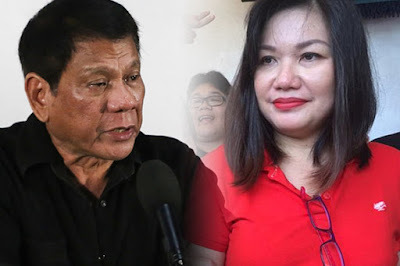 Home News Politics HONEYLET : NOT INTERESTED TO BE CALLED "FIRST LADY"
HONEYLET : NOT INTERESTED TO BE CALLED "FIRST LADY"
The common law partner of President Duterte said that she's not interested to be called as "First Lady" but "Tagapag-alaga" of our beloved President. Did you know that Cielito "Honeylet" Avanceña is a former Beauty Queen from Valenzuela? Yes! The "Tagapag-alaga" of our President is a Beauty Queen! She told ABS-CBN news that she wants to bring back the simplicity in Malañang if Duterte wins the Presidential race and now, our beloved Mayor Duterte won the Presidential race. "Yung sa amin ganoon pa din, nagbabago lang dahil yung bahay namin ay pinupuntahan na. Nagiging tourist spot. Madami ang nagpapa-picture sa labas, mga ganoon. Dati kapag lumalabas ako, derecho ako sa labas. Ngayon maraming tao," Avanceña said. "Gusto ko nasa sideline ako pero gusto advocacy sa health dahil nurse ako. Dating OFW ako. Businesswoman din ako ng small, medium enterprises...Ang gusto ko mag-volunteer lang. Mas ano sa akin yung walang bayad. Ayokong ma-involve sa government. It's not my cup of tea," she added. Avanceña said that it's a destiny's will that's the reason why they are together as Avanceña worked as a nurse in US for about four (4) years and came back in the Philippines for her destiny. Duterte and Avanceña has an 11-year old daughter named Kitty which remains grounded despite all the attention brought about by her father's victory and she added that their daughter will continue her studies in Davao City. "Mas convenient sa kanya na nandito. Marami akong kaibigan sa Manila. Yung buhay ba yun, you have to wake up at 3 AM estudyante gigising ka para umabot sa school," she said. "Dito, gigisingin ko siya 06:15AM, 07:00AM, 07:20 nasa school na." Kitty cried when she told the young girl that Mayor Duterte was running for President as her daughter don't want to stay in Manila. "Iniyakan niya first time when I told her: 'Your papa is running.'" "Alam mo, the Lord did not prepare you overnight kasi ang dami talagang looking back sa buhay, mga events sa buhay, maraming ano na dito siya pupunta." Avanceña shared. "Sabi ko, 'Lord, ipapahiram namin siya sa bayan. Ibalik Mo lang siya sa amin na buhay at malakas,'" she said. "Kasi mabuti naman siyang tao. May sense of humor yan at matalino. Wala kang makitang pinaka-patriotic na tao, wala akong pwedeng mako-compare sa kanya." Avanceña answered when she asked why she love the President. The former Beauty Queen told that she still hoping to get married with Duterte. Duterte's marriage with his first wife, Elizabeth Zimmerman, was annulled in 2000. "In God's time. In the fullness of God's time. Okay naman ako ngayon, wala naman akong problema," she said.